The FSRM series has been discontinued. Please contact our Temperature Engineering department for a viable replacement. Made-to-order to your hopper specifications. Low watt density design ensures long life while providing operating temperatures of 121 to 177°C (250 to 350°F) or higher. Heaters can withstand upset conditions where temperatures in the hopper may be as high as 649°C (1200°F). Manufactured from formed 9.5 mm (0.375") diameter INCOLOY® sheathed tubular low watt density elements for long life. Equipped with 15 cm (6"), 16 gauge nickel plated copper lead wire with mica type high tem per a ture insulation rated 450°C (842°F) for easy connection. Shock and vibration resistant design. Modules are fire resistant and not affected by internal hopper fires. 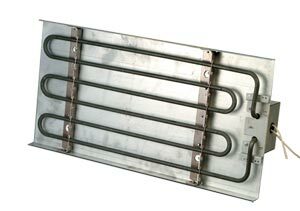 9.5 mm (0.375") Tubular Heating Elements are ser pen tine bent and mounted on a steel angle frame support with a backup aluminized steel sheet metal reflective encasement. When installed on the sides of the hopper and insulated, they provide a blanket heat coverage effect.